BETHLEHEM — The Town Board approved over 50 agenda items, including appointments, re-appointments and setting local officials’ salaries, at its annual organizational meeting on Wednesday, Jan. 9 at Town Hall. Dan Coffey, above, takes over for his predecessor, Giles Wagoner. Town Supervisor David VanLuven’s first order of business was to welcome new Town Board member Dan Coffey who would serve a one-year term. Coffey had officially been sworn in on Thursday, Jan. 3. Looking ahead, VanLuven mentioned several community events for residents to look out for. First, there will be a free two-hour presentation named “Don’t Get Scammed!” on Wednesday, Jan. 16 at 1 p.m. at the Town Hall’s auditorium, located on 445 Delaware Ave. in Delmar, where residents can learn how to avoid scams and con-artists. Second, VanLuven would deliver the annual State of the Town Address on Wednesday, Jan. 16 at 8:30 a.m. at Town Hall, where he would outline what Bethlehem accomplished in 2018, and discuss town priorities for 2019 — a continental breakfast would precede the event at 8:15 a.m. Third, there are four more comprehensive plan public forums across four hamlets which would allow residents to speak with town officials on issues they’d want the plan to focus on. L-R: Town Supervisor David VanLuven, and Town Board members Jim Foster and Dan Coffey. Delmar: Wednesday, Jan. 30 – Delmar Reformed Church, 386 Delaware Ave.
Elsmere: Thursday, Mar. 21 – Elsmere Elementary School 247 Delaware Ave.
Next, VanLuven set the salaries of certain elected officials: Supervisor — $120,377; Town Board Members (each) — $15,883; Town Clerk — $78,423; Superintendent of Highways — $106,077; Receiver of Taxes — $56,713; and Town Justice (each) — $55,995. The organizational meeting would then continue with almost 60 agenda items as the Town Board approved many housekeeping items like appointing and re-appointing other board members and town officials; approving town payments and fees; authorizing other departments’ salaries; setting regular Town Board meeting and Town Hall hours; establishing the Spotlight as the town’s official newspaper; and designating town employees’ 2019 holiday schedule. Town Board member Maureen Cunningham explains her decision to abstain from agenda item 10. Town Board member Maureen Cunningham notably abstained from — but stressed that she was not voting against — item 10 which concerned the appointment of Jim Grady to the Conservation Easement Review Board to a five-year term, ending on Dec. 31, 2023. “I’m abstaining because first, I was concerned we didn’t use consistent criteria for evaluating the candidate for this committee and I believe that transparency is not just about having the interview process but also being clear on the criteria on which we evaluate candidates and how we make decisions,” she said. She explained she wanted a more formalized outline of ideal qualifications that CERB applicants would need to be seriously considered for the position, and that the current outline is “confusing” and unclear. 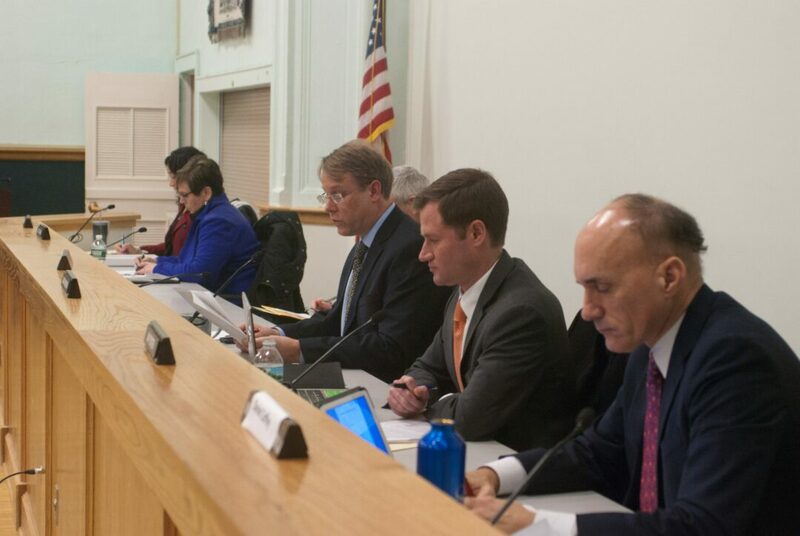 Neither the Town Board meeting nor its agenda disclosed exactly what the current criteria of qualifications a CERB member applicant is judged on for now. The meeting lasted just under 40 minutes. She did conclude by acknowledging that Grady, the chosen applicant, does have outstanding qualifications and skills, and she respected her fellow Town Board members for however they would vote on item 10 — they eventually approved. VanLuven then said that looking into the CERB application process “is something we’ll investigate” and that the town would always handle the appointment of board members, regardless of which department, seriously. The next Town Board meeting would be on Wednesday, Jan. 23 at 6 p.m.